It is mid-November and here in East Tennessee it’s getting cool. We’ve had a couple of light frosts at night, but the day-time temperatures still get up into the high 60’s and low 70’s, so much of the garden is still growing – it’s just not doing so as enthusiastically as it did earlier in the year. The weather guessers have issued a warning of our first real freeze: over-night temperatures in the mid 20’s. The carrots, onions, lettuce, spinach, chard, and herbs will be fine but the tomatoes and peppers will likely be ruined. 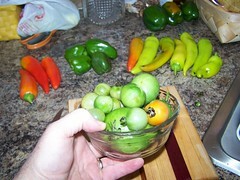 So I go out and harvest all the green and semi-ripe tomatoes, sweet peppers and hot banana peppers. But what do I do with all these green tomatoes? Last year we sliced, breaded and fried a batch of green tomatoes and very much enjoyed eating them fixed this way. This year the tomatoes are too small to slice and fry. Much of what I harvested are cherry tomatoes, the rest are red or yellow tomatoes that just did not get any larger than two to three inches in diameter. Others in this late crop that were able to ripen before I picked them tasted fine but did not get any larger. What I have now are still quite green. 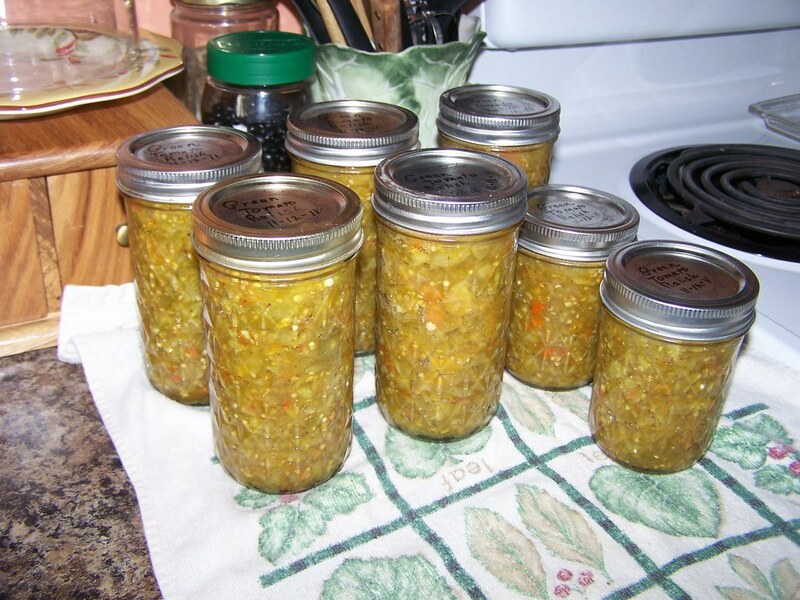 I decided to try making some green tomato relish. 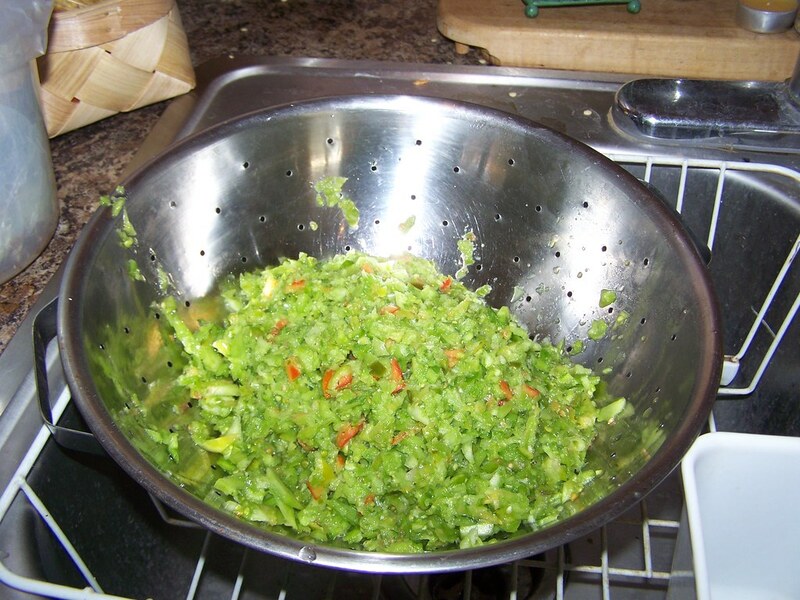 Relish is a useful and tasty side dish or condiment that can be enjoyed in a variety of ways. 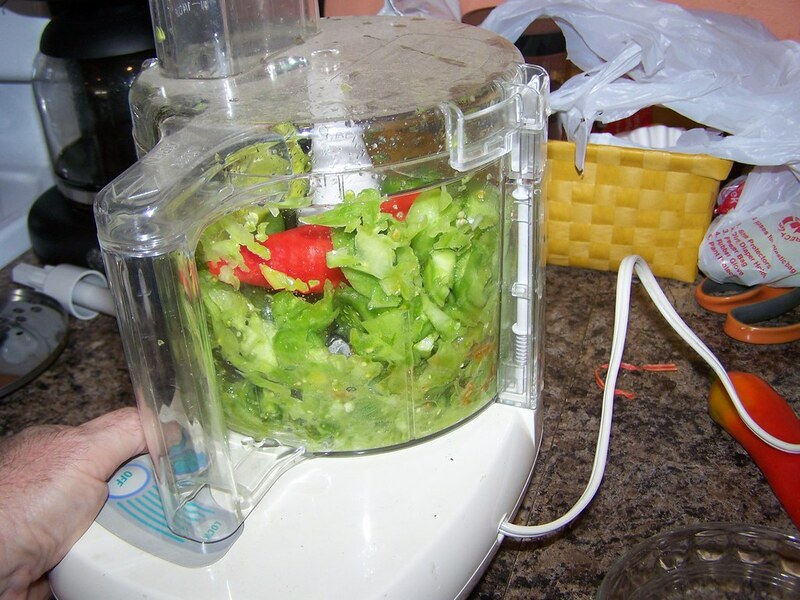 I found a recipe put out on the web by Linda McDaniel that calls for green tomatoes, red bell peppers, green bell peppers, onions, celery seed, mustard seed, salt, sugar and cider vinegar. I used Linda’s recipe as a starting point. I wanted to use up what I have on hand. Her recipe called for 24 large green tomatoes. I didn’t have large tomatoes so I fudged it by guessing that this dish-full of small tomatoes approximated one large tomato. Using this, I determined that I had an equivalent of 8 large tomatoes to work with. Eight is 1/3 of 24, so I reduced the recipe accordingly. She calls for 12 large onions. I like spicy relish, but didn’t want to go out and buy onions, so I used the hot banana peppers I do have. Some of those are ripe and have a nice red color. I’ll use the small bell peppers and sweet banana peppers as well. So the first step is to clean the peppers to remove the seeds and webbing. Then I drop an assortment of tomatoes and peppers into the food processor and use the pulse button to chop them. I quickly learn that the peppers are tougher than the tomatoes. To chop the peppers to the size I want means almost pureeing the tomatoes. Adjust tactic: chop the tomatoes and peppers separately. The chopping process is done in batches, then emptied into a colander. When all are chopped this colander will sit for an hour to let the excess liquid drain off. Being green, the tomatoes are fairly solid and do not contain very much liquid at all, but the semi-ripe tomatoes do. While that is draining, I set up my canner and sterilize enough jars to hold the batch. I have an assortment of small jars (half-pint) that are attractive, cut glass and will make nice gifts for friends and family (and I want to use up these small jars so this is a perfect project for that). 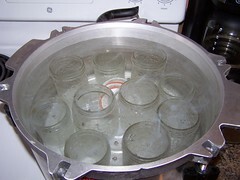 Boil the jars and lids for 10 minutes plus one minute for every 1000 feet above sea level of your location. 13 minutes for me. While those are boiling (and the maters are draining) combine the vinegar, sugar, and spices in a stainless steel or enamel pan. Do NOT use an aluminum or copper pan as these will react with the vinegar and bad things will happen. 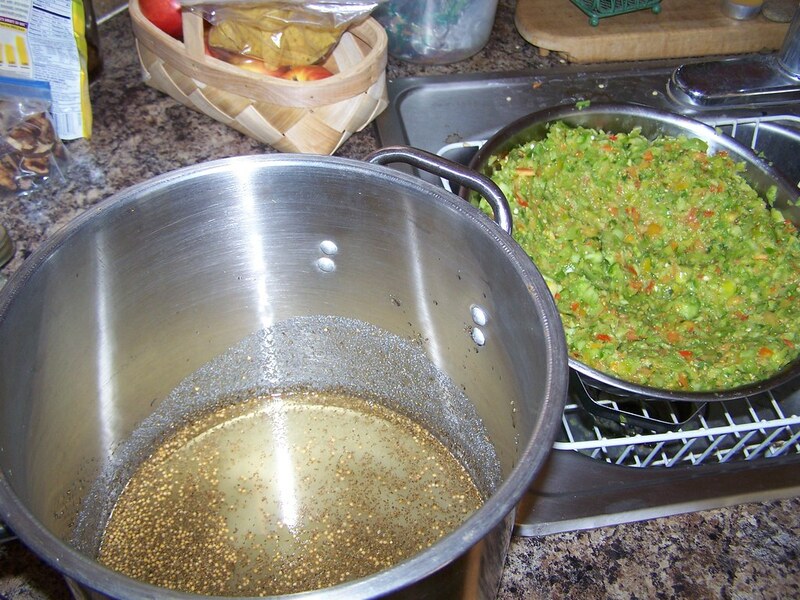 When the tomato/pepper mixture is drained, add it to the vinegar/spice mixture and heat it over medium heat. 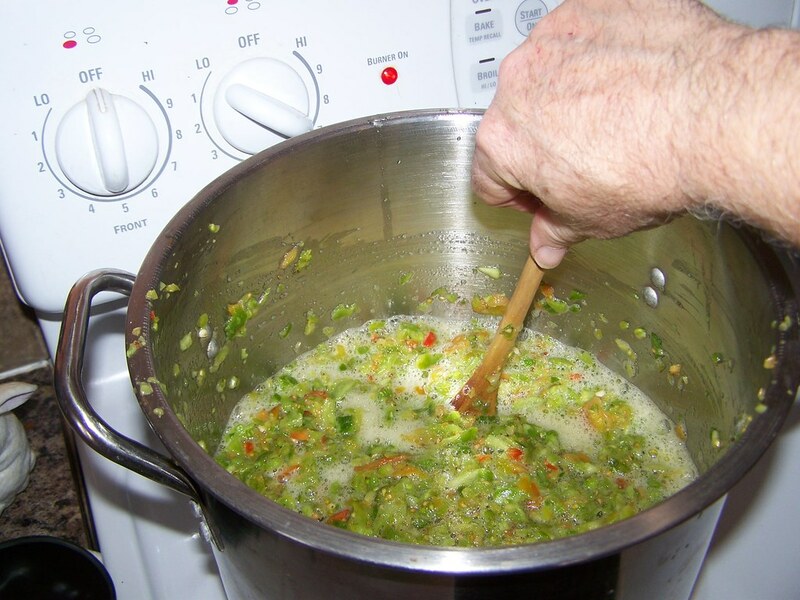 You want to bring this just to a simmer, and keep it there for 5 minutes, stirring frequently. When the jars and lids are sterilized, use tongs to pour the water from the jars back into the canner and set them mouth down on a clean towel to drain. 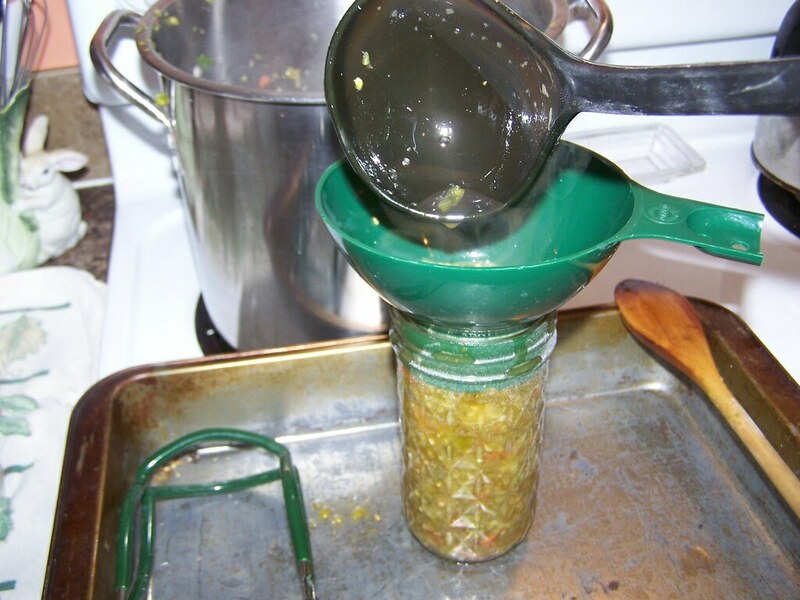 Use the magnetic lid lifter thingie from your canning tool kit (you DO have a canning tool kit don’t you?) 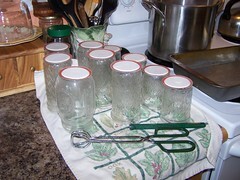 to lift the lids from the canner and place them atop the jars. Remember, these are sterile now, treat them as such and be careful how you handle them. Using a clean paper towel, wipe the rubber seals of the lids clean of any calcium scale left from the boiling process. Now fill your jars. A wide mouth funnel (from the aforementioned tool kit) is a great asset in this process. I also use a cookie sheet or cake pan as a work area – this can get kind of sloppy. Using the pan means less scrubbing of the stove later on. Fill the jars to the rim – no headspace required. Place the lid in place, handling it by the edges only, and secure it with the screw on ring, but tighten it only to finger tight. Exhibiting your manhood by cranking it down tight will only serve to thwart the canning process. The jars are still pretty warm from having been boiled, the relish you ladled into them was boiling hot (even just a simmer is still pretty darn hot). Use the jar lifter (from that famous canning tool kit) to set the filled jar into the canner again. Go ahead and turn the heat up under the canner so the water will be heading for a boil. Fill all the jars and put them in the canner, don’t let them touch one another or the canner. If you end up with a partial jar, put that one in the fridge and plan to enjoy it first. Make sure the other jars are covered with water by at least an inch, two is better if your canner is deep enough. 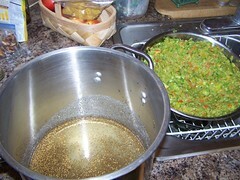 If not, keep an eye on it during processing and add hot water as needed to make sure the jars stay well covered. 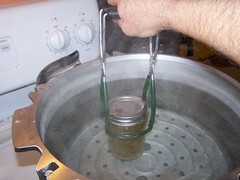 This is a hot water bath canning process; a pressure cooker is not required. Bring the canner to a rolling boil and keep it there for 30 minutes plus the elevation adjustment. When the processing time has elapsed, turn off the heat and let the whole shebang cool a bit before disturbing the jars. When you do pull them out (using the oh-so handy jar lifter) try not to jostle them or tip them. Set the jars on a cloth with at least an inch of air space between the jars and let them cool. After a few minutes you should start hearing the lids go “plink” as the contents cool, contract, and form a vacuum inside the jar, drawing the little blister on the lid down indicating that the jar is properly sealed. After the jars have cooled, test the seals by pressing down on the center of each lid; if there is any “give” it did not seal, refrigerate that one and plan to use it before opening the other jars. Now you may wipe off any calcium residue left from the canning process and label the lid with the contents and date. Canned foods should be good for one year. I remember as a child looking through the massive array of canned goods stored in my Grandmother’s basement and noticing that some of them had been there for many years. None of us ever died from eating those, so I guess you can get away with it, but the food safety folks strongly recommend using them within a year. Also, be sure you’re using lids with a white coating on the inside for anything containing vinegar; plain steel lids can be eaten away by the mild acidic property of vinegar. Even a tiny pinhole in the lid can admit bacteria that will cause food poisoning. Store your canned goods in a cool place out of direct sunlight. A basement is great, if you have one. I’ll let these jars of spicy green tomato relish marinade for a couple of weeks before opening up the first one, but if the spoonfuls of left-over raw product Marie and I tasted after I filled the jars are any indication, this is going to be good stuff -- and a great way to salvage the last of our tomato and pepper crop! I've tried that in the past, Mary, with moderate success. I tended to forget to unwrap them all and check them every couple of days, pulling out those that are getting close. When I forget, they rot. Any juice that leaks out of the newspaper spoils any that are in contact with them. This year they were all so small they would not have been worth the effort. Now that I'm more into "farmer mode" if we get larger late tomatoes next year I might do better at remembering that I have a box of tomatoes lucked away that need checking. Thanks for the comment - and the reminder. Our freeze in NW Alabama was on the same schedule as yours. If I have larger tomatoes I like to wrap them in newspapers & put in a box in a dark area. Checking them one a week or so and pull out those starting to ripen. We've had tomatoes through Jan a lot of years. Thanks Dave! I've had fun with the water bath canning this year. Pressure cooker canning is a bit more scary - particularly because my first try resulted in being burned by an exploding jar of tomatoes. My own fault - I rushed the process and didn't let them cool before taking them from the canner. Lesson learned. Allan, you description of the water bath process of canning was magnificent. It was very clear and understandable. I didn't have many green tomatoes this year. The vines dried up in early fall and I just left the green tomatoes on the dead looking vines. They continued to ripen but like yours they were small but were terrific for salads. Have a great Thanksgiving.